Llandudno is the largest resort town in Wales, located between Little and Great Ormes it boasts two wonderful, family friendly beaches. The Beach of the North Shore has won awards for cleanliness and is a great place to spend a few hours playing with the kids, whereas the quieter West Shore with its rolling sand dunes is the perfect place to escape for some tranquillity. As a resort town it boasts both a Victorian and an Edwardian heritage and as such remains somehow more elegant than other resort towns. Yet for all of its history and it’s elegance it still has many modern attractions to please its visitors. Tourism boomed in the town once the cable tramway had been built which meant that visitors no longer had to trek up the mountainside. Even before the new and ground breaking tramway had been finished the town was already working on building a new hotel. This hotel is still standing though it has seen many renovations including being converted for use as a radar station in 1941, and even a fire in over a century of history. An innovative cabin lift was installed in 1969, running from the Happy Valley – the towns ornamental gardens up to the summit. This cabin lift holds the record for being the longest in the whole of the United Kingdom. Travelling to the summit this way offers the most spectacular views and you sail through the air. There is a great focus on protecting the environment and the visitor centre is very pro active in promoting environmental awareness. There are a number of guided walks that take the visitor through the area which points out some of the areas main attractions. Close to the ornamental gardens, known locally as the Happy Valley you will find a dry ski slope where you can try your hand at skiing. This is not just a visitor attraction as every year the ski centre here hosts the Artificial Ski Championships. The town is sat atop old copper mines, exploration of which has yielded artefacts dating back to the Bronze Age, as a result a Bronze Age replica mine has been opened to the public where you will be able to see the very modern archaeologists hard at work. Take a break at the Old Rectory Tea Gardens and enjoy the award winning gardens with their colourful flower beds. Back in 1862 a massive light house was constructed on the rocky headland, to many it appears more like a castle than a practical lighthouse. Although the light no longer shines out to sea, the incredible structure is still there and still very much in use as a rather quirky and unusual Bed and Breakfast establishment. Travelling outside of the town you will discover the magnificent Conwy Castle only five miles away. 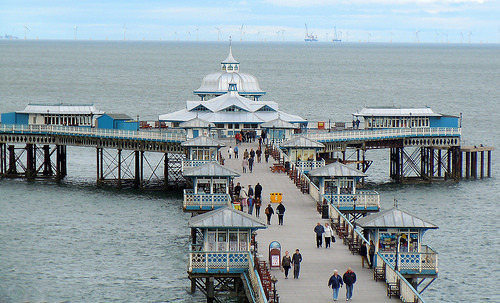 Whatever you come to Llandudno for you will find it, at the place will stay with you until you come and visit again.